Jakob Kolding is best known for his hand made collages and posters in which he samples and mixes the visual idioms of art, architecture, literature, theatre, and music. Since the late nineties, Kolding has been creating his own vocabulary of cut-outs that continues to grow and expand with time. The same elements are re-used and re-contextualized in different works, constructing a variety of context-dependent meanings and narratives. Whereas his early works were mostly made with reference to a specific time and place, usually revolving around the relationship between the ideologies of urban planning and the actual use of space, his newer works are more abstract and hence more open for interpretation. 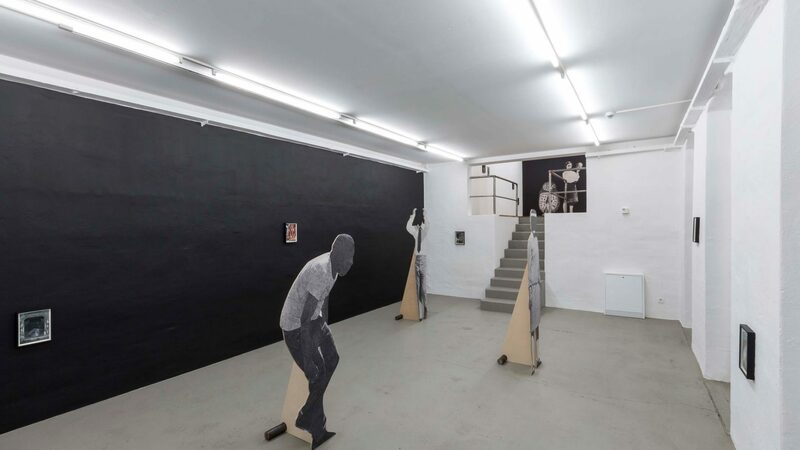 Recent years have also witnessed a gradual development towards the 3-dimensional in his work: arrangements of sculptural figures, life-sized wood cut-outs printed with black and white imagery, transfer the collages into the actual space. Kolding creates scenographies — stagelike settings that invite viewers into a tableau vivant while demanding that they constantly navigate their own spatial experience. The exhibition at ACUD brings together both a group of sculptural figures and a selection of new small-scale collages. Through their size and the depth of their frames, these collages allude to historical dioramas. Dioramas were originally produced as miniature scenes in three dimensions with objects and figures placed in front of a painted background in order to create a realistic impression. In inviting people to look at, and often literally enter such a setting, the emphasis lies on the viewer and their imagination. Instead of being presented with a complete vision, or with something posing as fact, openness and ambiguity are at the core of these viewing apparatuses. The show’s title, dislocated discolated, represents Kolding’s ongoing fascination with the potential for something new that lies in every breakdown, collapse, or change in general. Dislocation stands for disruption, for a state of being displaced. More concretely, it can be read as a reference to one of the most challenging issues of our times. ‘Discolation’, on the other hand, is a word made up by Kolding himself by simply rearranging the existing letters of the original word (a word game that he pursued to an extreme in his new four-part poster produced for this show, which will also be hung up around Berlin). It entails the word ‘disco’ that is associated with a variety of celebratory, shimmering meanings. The concept of dislocation probably comes into focus most prominently with the collage Foreign Fish (2017), in which a couple of men stand inside Mies van der Rohe’s famous Seagram building and stare at a gigantic, colorful fish passing though the otherwise grim surroundings. The safety of the rigidly planed inside collides with the chaotic phantom-like outside — a landscape and a group of people on a raft taken from the original illustration of Jules Verne’s Journey to the Centre of the Earth. All of the cut-outs are black and white except the fish. Simultaneously strange and beautiful, it introduces a new order. By continuously creating these speculative topographies, Kolding points at an openness that is at once challenging and reassuring. Jakob Kolding (*1971 in Albertslund, Denmark) has exhibited extensively throughout Europe and the United States. dislocated discolated is the artist’s first solo show in Berlin. He is currently working on a stage set for the Bregenzer Festspiele and regularly writes for the Berlin based magazine Starship where he translates his interest in reinventing and (de)constructing meaning into texts that reflect on his favorite books. Kolding´s previous exhibitions include: The Museum of Contemporary Art, Chicago, IL; The Stedelijk Museum Bureau Amsterdam, Amsterdam, The Netherlands; The Frankfurter Kunstverein, Frankfurt, Germany; Kunsthalle Wien, Vienna, Austria; Palais de Tokyo, Paris, France; Kunstverein in Hamburg, Germany; Museum Villa Stuck, Munich, Germany; Moderna Museet, Stockholm, Sweden; CCA Wattis Institute for Contemporary Arts, San Francisco, USA; The Museum of Contemporary Art, San Diego, California; and The University of Michigan Museum of Art, Ann Arbor.